Arguably the most technologically advanced nations on earth, Japan, still loves Yahoo. Once you get your head around that odd fact, feel free to proceed. Please take a look at this…Geocities page. Once you finish cringing and/or chuckling at the 90s-style web design, take a closer look because this is the most amazing thing I’ve seen. From what I can tell, it’s a club devoted to building molecular models and teaching this skill to others. You’ll see (tiny) photos of schoolkids gluing together their own models, grown men standing proudly with their latest efforts, club members working together in a shared workspace…it’s absolutely fantastic! And this method of building space-filling models from styrofoam balls appears to be completely unique. It’s attributed to Masao Yamada, whose identity I have not been able to determine. As a model-maker who’s dabbled in space-filling models, I am impressed by how simple tools can produce such elegant models…even by schoolchildren! 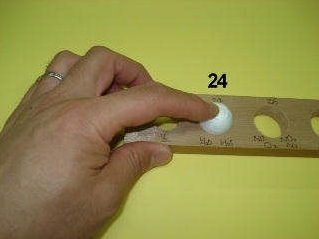 Using a hand-held hot-wire cutter, the styrofoam is neatly cut across the circle. Easy! 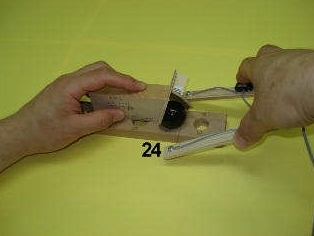 You can see the jigs are simply made using thin wood (balsa?). And they’re affordably priced at 540 yen! (About US$5.00.) The boards with the holes are the same price. Obviously, the goal here is spread this hobby and not to make a profit. With everything cut, the models are assembled with PVA glue. I really wish I knew how to read Japanese. And I wish something like the Otaru Molecular Model Association existed outside of Japan!